It is only the third edition, but the Magnificent Merapoh Trail in Pahang, Malaysia, is quickly establishing itself as a true trail classic in these humid summer months in Asia. The event is drawing a lot of attention because of the several cave sections, which makes it rather unique, and can also again showcase a strong international field of participants. The main 100k course is largely the same as last year, including the long river crossing, but new is that the course will be run in reverse this year. Last year's 60k has been upgraded to 70k, which also makes it a Grandmaster Quest distance. Within the context of the Asia Trail Master Championship series, there are plenty of top ranked runners in Malaysia this weekend. Especially in the women's: the entire top 7 of the current championship ranking is here! Only Kim Matthews (4) is missing, the Australian is aiming for another victory at the Vietnam Mountain Marathon next month. A significant late entry is defending champion Tahira Najmunisaa Muhammad Zaid. 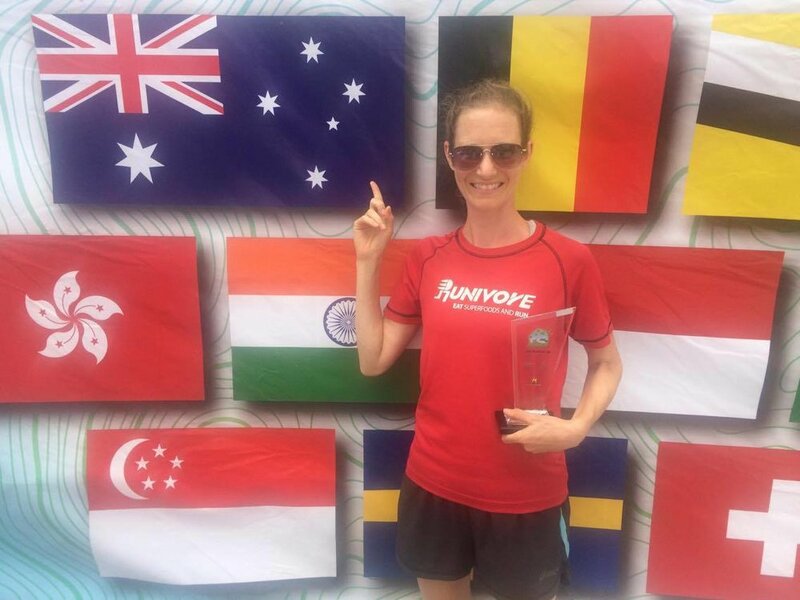 Two weeks after cruising to victory in the Plataran X Trail in Bali, the popular Malaysian feels ready for the 100k distance again after a rather difficult first semester this year, in which she nonetheless has remained unbeaten on the Asia Trail Master circuit. If we include the Bali Candidate Race, Tahira can score her 10th race victory this Saturday. No man has done better. However, it won't come on a silver platter. Tahira is facing Indonesia's Ruth Theresia, the current points leader in the 2017 Championship and who has a quick pace on flattish trails as well. The Bandung Explorer leading lady has recently also become the second female Grandmaster after her compatriot Ina Budiyarni last November. Ruth is on a roll this year with four ATM race victories including last week's extremely tough Mantra Summits Challenge in East Java. However, two weeks ago in Bali, stomach cramps forced the busy bee to retire from the race eventually won by Tahira as well, perhaps showing some signs of vulnerability after running so many races in the last months. In any case, the Merapoh Trail will be important for both of them this weekend. Should both finish the ATM season with equal points, the advantage goes to the winner of the last direct dual. There's a few other strong podium candidates in the women's race. Runners who on a given day could even interfere with the plans of Tahira and Ruth. Among them is definitely Shindy Patricia, also from Indonesia, Mt Apo Sky Race winner Manilyn Mamugay from Mindanao in Philippines and Sabah's Adelinah Lintanga. In the runable Ijen Trail 100, Shindy Patricia was leading nearly the whole race until Ruth caught up in the very last kilometre and beat her in the sprint. Shindy likes it technical as well, so her third place considerably behind Tahira in Bali should not necessarily be a true measure of her current form. Manilyn Mamugay has two ATM race victories on her record (Mt Apo 2017, The Punisher 50 miles 2016), and is running for the first time outside her home region. Modest in her ambitions, apparently, yet last year her country woman Gretchen Felipe also came to conquer Merapoh. Malaysia has a third iron in the fire with Faherina Mohd Esa, who was second in this race last year and tenth in the overall ATM Championship. Finally, it should be noted that current ATM #2 Lily Suryani is within striking distance of Ruth Theresia's points lead should things go wrong for the latter. Suryani is 275 points adrift and will be running her fifth ATM race this season already, having collected podium places at Penang Eco 100 miles and Beach Bunch Trail 100 in the process! Philippines's Cheryl Bihag is having her sixth ATM start of the year even, her eyes now very much set on the Grandmaster Quest. In theory, Yim Heng Fatt can take over the men's championship lead this weekend from Steven Soonseng Ong. But only if he wins the race. Yim has had a strong season with good placings all over Asia. As with Ruth Theresia, though, how much of Mantra will still be in the legs this Saturday? Someone who has been focusing on training in the past weeks with the sole objective of winning the Merapoh Trail is Isaac Yuen Wan Ho. There's virtually no racing in his native Hong Kong these weeks, and the number five in the current points standings is keen to return to Merapoh after finishing a superb second last year. Yuen Wan Ho was recently lauded as "most improved runner" in Hong Kong, and arguably it was at Merapoh 2016 where he managed to make that last step to winners' level. If he sets the same blistering pace as he did in Penang last May, it will be interesting to see who can follow him. One guy most likely will: Sefli Ahar from Brunei. The policeman wants to set the record straight after the unfortunate DNF at Penang Eco. Sefli is a road runner, who after two consecutive victories at the Beach Bunch Trail Challenge decided to give trail and the Asia Trail Master Championship a shot. His inexperience cost him dearly in the Penang race, but this weekend he is unlikely to repeat the same mistake. Yet, it is trail, and the 100k ran mostly in the dark hours. Come sunrise, anything could have happened. As usual, we will be reporting live from Merapoh, signal permitting. The coverage will start on Friday afternoon. After the flattish BNI Plataran X Trail in West Bali National Park a week ago - a 50k race dominated by our Asia Trail Master champions Manolito Divina and Tahira Najmunisaa - we move to East Java for the second 2018 Candidate Race in Indonesia. The Mantra Summits Challenge at the Kaliandra Eco Resort in Malang may have the same distance as the Bali race, but this weekend it will be the climbing goats to make the beautiful weather rather than the fast-paced runners. Nearly 4200 meters of elevation gain over 51 km and two peaks of more than 3000m altitude. Even the 30km (2800 hm) is very tough. Perhaps no surprise that good old Jan Nilsen feels attracted to Mantra Summits Challenge. Nilsen is coming back to his best level and is keen to add another Indonesia race victory on his record. Remember, Jan was unbeaten in this country last year with wins on Rinjani, Bromo and MesaStila Peaks Challenge. This year, however, he had to tolerate Pablo Diago Gonzales ahead of him at Ijen Trailrunning 70 in May. And guess what: Pablo Diago is also on the start list this weekend! Nilsen vs Diago part 2. Any dark horses? There surely are with Ijen 100 winner Dzaki Wardana as a very motivated contender. In the women's race Ruth Theresia and Shindy Patricia are again expected to battle for victory. Russia's Anna Kosova, second and not too far behind Tahira in Bali last week, may turn up as welll. We will be reporting from the Kaliandra Resort starting tomorrow on our social media channels with photo and video. One month after the Jungle Marathon, Vietnam is again in the spotlight this weekend as the Tam Dao Mountain Trail is on the Asia Trail Master Championship programme. Hosted by the Belvedere Resort 1,5 hours northwest of capital city Hanoi, the 70 km race is highly anticipated and has the potential to grow into a classic. The race course is very interesting and quite unique, with the big climb of Tam Dao coming at the very end of what is otherwise a runable course. The 70k starting field sees several big names, and two runners can even become the new leader in the male Asia Trail Master Championship ranking. Four runners of the current male top 10 will be competing this Saturday! Vietnam is increasingly establishing itself in the Asian trail scene, and this second of three points races in the 2017 Asia Trail Master Championship can also count on the participation of the first local star Cao Ngoc Ha. Third in UTKC (Thailand SuperTrail) and winner of the Vietnam Jungle Marathon, Cao Ngoc Ha can make a statement this weekend. One of his main competitors will be Malaysia's Steven Ong, who finished ahead of him at UTKC, but being a real endurance athlete may find 70 km a little too short. In any case, Ong will not be able to afford himself an easy start this time around. It's a big occasion for the ULTRON athlete, as he can take over the lead in the ATM championship from Arief Wismoyono. Tam Dao will also be his 4th ATM race of the season already. But were Ong to have an off-day, Spain's Pablo Diago Gonzales can take over also! Residing in Singapore, Pablo Diago is on a winning streak with victories at Mt Apo in the Philippines and at the Ijen volcano in Indonesia in the past two months. Can he add Tam Dao to that list? Note that both those races were also.... 70 km. And in the end there is also Hong Kong's Isaac Yuen Wan Ho, who showed at Penang Eco six weeks ago he is absolutely flying at the moment. Although also a typical 100 miles runner, Yuen Wan Ho has the speed to put all the others on the backfoot from the get-go. All things considered, he may have the key to victory this weekend and propel himself into a championship-winning position later this year. For him, it will be the third race of the season. One peculiar characteristic of Yuen Wan Ho, though, is that he has a subscription on second places. In the women's the outspoken race favourite appears to be Australia's Kim Matthews. The rather unfortunate runner-up at Penang Eco 100k (Matthews led the whole race until she fell asleep at the final checkpoint and then saw China's Dong Minfei pass by to grab the win), has recently moved to south Vietnam and is another fast-paced runner who can be expected to open up a gap in the early stages and hang on during the Tam Dao climb. Matthews, after all, won UTKC 70 k last February. In her third race of the ATM season, she can hop over Tahira Najmunisaa to fourth place in the championship. The same applies to Siawhua Lim from Malaysia, albeit in her 4th race already. As usual we may encounter a few new names as well this weekend. After all, this is trail running and even in a new trail country. We will be reporting live from the event - signal permitting - via our social media channels. Isaac Yuen Wan Ho: the man to beat? THe Echigo Country Trail has established itself as one of those unique races on the Asia Trail Master calendar. Not necessarily because of the race course or distance (52 km, 2000 hm), but because of the warm and jolly atmosphere during the event. Festivities already begin this afternoon at race pack collection and are followed by an organised dinner at Oguni Forest Park, close to Nagaoka in Niigata. That is the west coast of Japan's main island and north of the Japanese Alps. Local communities are delighted to have the race and come out to cheer for the runners, as if it were a road marathon. The race tomorrow morning itself promises to be a good one as well again, with several top Japanese runners present, mixed with motivated international runners. Jun Kaise, second last year and recently winner of the Kushigata Wind Trail is a favourite, along with Shunsuke Okunomiya. Our team is present at the Echigo Country Trail and as usual will be reporting live, signal permitting. Follow the action on our social media channels. Japanese trail running is gradually becoming more accessible for international runners with also the IZU Trail Challenge coming up as the Asia Trail Master final and Japanese SuperTrail later in December. Registration for the Izu Trail is now open but remember only until the end of this month! It is one of the biggest races in Japan and fills up very quickly. Ijen. That means every runner has a good chance of completing the distance and return home happy, especially those who are attempting their first ever 100K. Sempol, which serves as the race venue, is a very remote location and it takes time to get there, but the several hundreds of participants will certainly not be disappointed. The Ijen volcano is a fantastic sight to see. the only finisher of the 100k race at Rinjani. Not bad for a 50-year-old from chilly northern Europe! runner and has ATM Championship ambitions. He starts as the man-to-beat on the 70K, which is a Grandmaster distance and as the 100K accredited with 400 performance points. the first semester of 2017. Ruth Theresia in particular can put the pressure on her main championship contenders Tahira Najmunisaa, Sandi Menchi, Kim Matthews and co.
Mila Marlina is another podium and potential race win candidate on the 100k, and on the 70k we can expect Grandmaster Ina Budiyarni to be close. The second SuperTrail race of the 2017 Asia Trail Master Championship series is taking place this weekend in Malaysia. The 3rd edition of Penang Eco 100 in Bukit Mertajam is the biggest so far and can sport an outstanding quality field of participants on the 100 miles and 100k races. As such, this event can again have major implications for the championship, as it did last year when Manolito Divina and Tahira Najmunisaa laid the foundation here for their respective ATM champion titles. Organiser Seow Kong Ng, himself a relished ultra runner since many years, is delighted to see his event grow so well and attracting some of the best runners in Asia. Because make no mistake, despite the relatively modest elevation gain, Penang Eco is a hard one with most of the venom in the tail. The 100 miles, especially, is basically flattish for 100k (! ), before it becomes quite hilly and technical for the last 60 km, which makes this race quite unique. You need to be a solid runner, and keep enough fuel in the tank to survive the hills at the end. When looking at the start list of the longest race distance, the podium favourites are plenty, but a few known names stick out: current ATM championship points leader Arief Wismoyono, his Indonesian compatriots Abdul Aziz Dermawan, Hendra Siswanto and Alan Maulana, Yim Heng Fatt from Malaysia, and Hong Kong's Isaac Yuen Wan Ho. We can expect an intriguing battle between these runners for the 575 points that are up for grabs in this 100 miles race, more points than in any other race on the ATM calendar. Wismoyono has prepared himself with focus on this weekend. The Bandung Explorer ace already scored a race win at Coast To Coast Night Trail this season, along with a third place in Sungai Menyala and fourth in Tahura Trail. However, these were all relatively short races. Can he keep his momentum over 100 miles in the same way that Isaac Yuen Wan Ho has proven he can. The sympathetic Hong Kong runner is a true 100 miler, winning HK 168 last year and always moving up the leaderboard the longer a race lasts. Isaac was second in Beach Bunch Trail Challenge 100 this season, and just like Wismoyono has ambition for the ATM championship. Also Hendra Siswanto is already doing his third race of the ATM season. Currently ranked 9th in the championship, he can move up a few places this weekend. Ultron runner Yim Heng Fatt is even entering his fourth race already and can find himself in second place in the ranking after Penang Eco, or even in first should Wismoyono fail to reach the finish. Maulana - 9th in Tahura Trail - and Aziz Dermawan are set to get their ATM campaign really going this weekend. Watch out for the latter - as he might as well steal the spotlights away from the others! Henry Yang from Singapore is another dark horse. Yang is in Penang to get revenge. He was running in second place last year, until a fall in the late stages of the race forced him to retire with an injury. The women's 100 miles also sees the participation of 6 runners, who should all be applauded for their bravery. The cut off time of 40 hours is very tight, as was proven last year by Tahira Najmunisaa, who finished in 38 hours. We can expect a contest between Ruth Theresia from Indonesia and Sabah's Adelinah Lintanga. Theresia normally has the edge in terms of speed, but Lintanga loves this race and won the Penang Eco 100 k race last year in impressive style. It is unchartered territory for both, as it will be their first 100 miler. Currently ranked third and seventh, both runners can make a good move in the women's championship ranking, but they cannot catch championship leader Cheryl Bihag, who has already done five races this season. The other starters are Lily Suryani, Mila Marlina, Christine Loh and Siti Hailwa Marjunit. The 100 km race distance also has a comprehensive list of potential winners and podium candidates. Steven Soonseng Ong is arguably the home favourite and very much in shape this season. Ranked fifth in the current ATM ranking, Ong was of course the joint winner of UTKC in Thailand and second at Sungai Menyala. At Penang Eco, he will have to try and cope with the pure running speed of Brunei's Sefli Ahar, the dominator of the Beach Bunch Trail Challenge in the past two years. A former winner of the Hong Kong half marathon, Sefli Ahar has developed an appetite for trail running. What he owns in speed, he lacks in technical trail experience. And that is what Steven Ong and other contenders may need to count on this weekend. It is great to see Eni Rosita back in action this year and that is an understatement. Victim of an incomprehensible acid attack last October that required multiple skin surgeries on both her legs, the Indonesian runner has not only returned, she has already found back her quick pace of before, illustrated by podium places and victories in local trail and ultra road races. This weekend in Malaysia, she enters the Asia Trail Master series on the 100k. Given her pedigree, Rosita starts clearly as a podium candidate, and will likely have to deal with her compatriot Shindy Patricia and Australia's Kim Matthews for the victory. Both runners also know how to win races. Other known runners with podium chances are Siawhua Lim (MAS), Montha Sunthornwit (THA) and Jocelyn Cheung (HKG). While the 100 miles offers extra bonus points for finishers, you of course need to finish first to score any points. The 100k may therefore turn out to be a smart tactical move by some with a view to the ATM championship. As usual, we will be reporting live from the race via our social media channels. It's already the third edition of the Tengri Ultra Trail this weekend, Kazakhstan's premier trail running event. Well-established on the calendar by now, the event attracts ever more runners to this remote but stunningly beautiful area. Tamgaly Tas along the big Ili River is not for nothing a UNESCO World Heritage Site with rock paintings, canyons and prime grassland with snowcapped mountain peaks on the horizon. The event follows the same concept as last year featuring a 70 km main race, which qualifies for the Grandmaster Quest. Less ambitious runners can also opt for 35 km and 15 km, but it's the longest distance only that counts for the ATM Championship. The camping area for all runners at the Heritage Site is still the venue for start and finish, and there is still no connectivity neither (so race updates will come with delay this weekend). Experienced Belgian ultrarunner Luc Hapers ranks among the top favourites this weekend, alongside Russian Yura Shtankov, a race winner at home and abroad. Of course, the local Kazakh athletes cannot be underestimated neither. There will be more opportunities to show their talents on the trail soon, as the Altai Ultra Trail is not too far away, and another race in Almaty is under preparation for later this year. This Saturday trail runners have a unique chance to climb Mount Apo, the highest mountain in the Philippines at 2954m above sea level. Race organisers Vertical 2 Sky have managed to get an exception from local authorities to allow runners to enter the Park area, which has been closed for mass tourism following the big El Nino-inspired bush fire from a year ago. The Mount Apo Sky Race is a technical out-and-back trail of 70 km - Grandmaster Quest distance - and the first of two ATM points races on Mindanao Island this season (Ultra Trail Mapawa follows on 29 October). As last year's Mapawa and The Punisher events showed, races on Mindanao seem to open a new can of great runners every time. The established names on the current start list should therefore remain on guard. However, spotlights will shine in any case on Aleksis Capili. The Thailand-based Filipino is going for his second Grandmaster star this weekend at the Apo Sky Race. It's almost a year ago since he became the first ever Asia Trail Grandmaster by finishing six ATM races of 70+ kilometres within two years, and now he has reached 10 - provided he crosses the finish line, of course. What is amazing is that Capili's running speed and results have been improving as well in the course of the past twelve months. Even to the extent that Capili is currently sixth in the 2017 ATM points championship and can move firmly into the top 5 this weekend. Arief Wismoyono and Gaspard Dessy are beyond reach, but Capili could split the Malaysian duo of Steven Oong and Yim Heng Fatt. One of the race favourites on paper is certainly Singapore-based Spaniard Pablo Diago Gonzales. Fourth a few weeks ago in the Sungai Menyala Forest Trail in Malaysia, Gonzales can move up to the top 10 in his second ATM race of the season. He is not only a fast-paced runner, he climbs well, too, making him perfectly adapted to the course of the Mt Apo Sky Race. A local runner to watch out for is Rene Amigleo, who was second in The Punisher 50 miles last December. Finally, a quintet of women will also attempt to do the big 70k race this weekend. Stay tuned this weekend on our social media channels for updates on the Mt Apo Sky Race! It may be strange that an ultra trail event is being organised on a Tuesday, but there is a very good reason for that. Tomorrow, 25 April, it is exactly two years ago that Nepal got struck by a massive earthquake that killed at least 9000 people and injured 22,000. Entire communities in and around capital city Kathmandu were destroyed or at least cut-off from the rest of the world for many days. Ultra Trail Nepal is set up by Som Tamang who lost his own brother in the disaster, and is a non-profit event to help Batase and neighbouring communities with the rebuilding and relieve efforts. You can read about Som's remarkable story in our Talking Trail Running episode from not so long ago. UT Nepal is set to stay and determined to become a fixed appointment on the trail running and the Asia Trail Master Championship calendar. This year the longest race covers a respectable 85 km - so all finishers also score a point for the Grandmaster Quest - and is essentially a run from Kathmandu to Batase. The race begins in the tourist district of Thamel, in the heart of Kathmandu. It then heads into the Shivapuri Watershed and Wildlife Reserve, and then to Chisopani (2300m) where it joins the main trekking route to Helambu and Langtang. From there it goes downhill to Patybanjyang, where you will experience some great views of the Himalayas. From Patybanjyang you will follow the main Helambu trekking route to Thankuni, from there you will follow the trail to Batase Village. Nepal has many strong trail runners and they will be starting as favourites for the inaugural event. Samir Tamang is well-known on the international circuit and arguably is the man to beat. In the women's, however, Australian Kim Matthews is certainly one of the big favourites. Matthews won the UTKC 70 race in Thailand in February and showed great speed in that race. Another fine result now in Nepal would bring her into the mix for the ATM Championship honours. As she lives in Thailand, she will feature in more ATM races this season, too.